A new free-to-play mobile game arrived today carrying with it the NBA license. NBA All Net is card-based which has become the popular route for many mobile offerings to take as of late. Players can take part in various games where they can relive historic career highlights of NBA players, survive the Road to Glory, battle their way through tournaments, take part in competitive leagues or compete in Ranked Matches and rise to the top of seasonal Leaderboards. ♦A roster of over 500 NBA players from both past and present. ♦Collect, manage and customize a roster of up to 300 players. ♦PVE: play Legendary Match and relive your favorite player’s career highlights. ♦PVP: compete in weekly tournament and matches to outrank them all. ♦Build your five most powerful player lineup leveraging equipment, training, and evolution to become a top competitor. ♦Keep track of your favorite teams throughout the NBA season with live standings. Future updates for the game are said to include new player cards, new game modes, and weekly events. 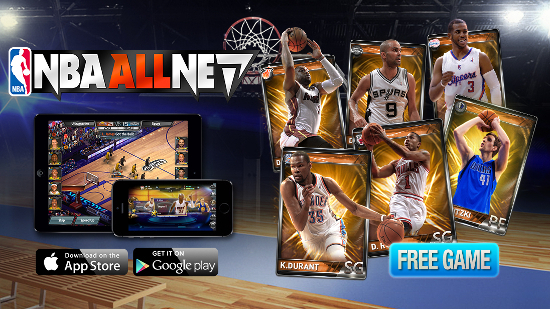 Download NBA All Net through iTunes for iOS or Google Play for Android. [Update] Apparently it won’t be out for Android until November 26, which would explain why you might see the message that the app is incompatible with your devices.